There is not another door manufacture who can match our combination of the finest quality materials available, and master hand craftsmanship. At ArtFactory.com we build the finest custom doors available anywhere at any price. This custom, Art Nouveau door is inspired by Jules Lavirotte's famous door at 3 Square Rapp in Paris, France. 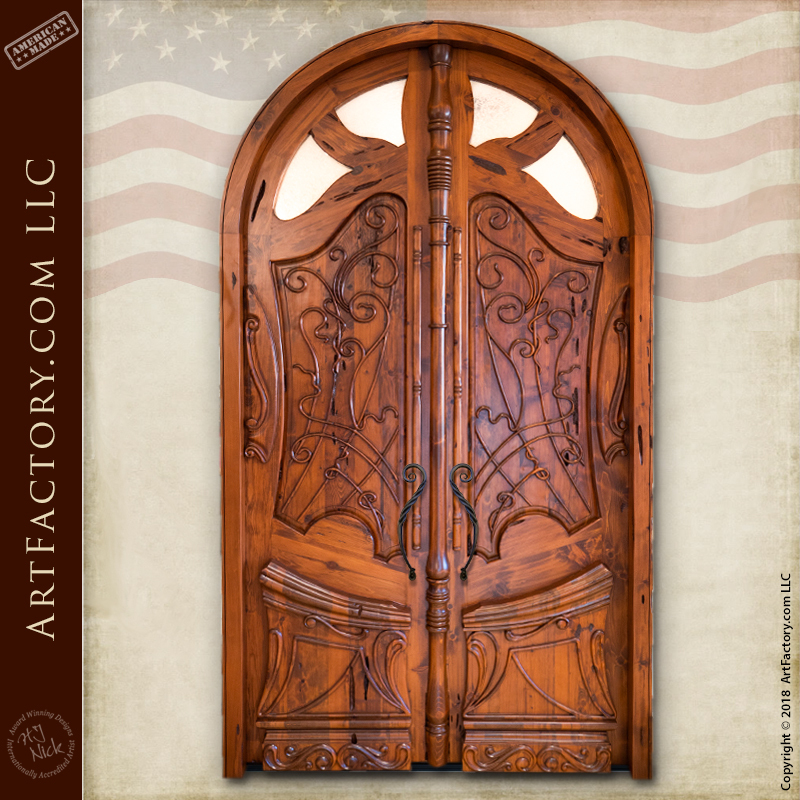 This historically inspired door by ArtFactory.com is just one of many styles of Art Nouveau and Lavriotte inspired designs that we offer. (See Also Jules Lavirotte Inspired Entrance Door) Most importantly, all of our historically inspired doors are built in original craft. That means built in the same hand and materials that Lavirotte used over a century ago. This makes for a unique, fine art quality product that is built to investment standards with future antiquity value. These doors are not machine made, mass produced, of made using any kind of fast process. This means that your custom door will be built by the hands of our master craftsmen, and never built by machine or mass produced. Not only are our doors built individually by the hand of master craftsmen, but are also constructed from only the highest quality, all natural materials. This includes full length, naturally air dried, American timber, energy efficient, dual pane glass, and solid blacksmith forged, wrought iron hardware. That means that all of our handles and hardware are built by the hands of classically trained blacksmiths, using hammer and anvil over a coal fired forge. Furthermore, all of our custom doors are built using mortise and tenon joinery for construction that will stand the test of time. Our historically inspired door designs are not reproductions. Each is an original design by award winning artist H.J. Nick that has been built using the same hand and materials that were used to build the originals. In fact, if it were not for these artifacts, it would be impossible to know these people ever existed, and how they were important to history. This is also the case in the 21st century within your own family. No matter if it’s a simple, hope chest with your personal message or name as a gift to a loved one, or extravagant, fine art quality, master handcrafted, custom Art Nouveau door, these items will be important to the story of your family history long after we are gone. Why settle for a low quality mass production door that is destined to end up in a landfill, when you can own a genuine work of fine art that will add to the value of your property, and is built to last forever. Like all of our custom, handmade entrances, this is a fine art quality, Art Nouveau door. Our combination of the finest materials, and master hand craftsmanship allow for us to offer a quality of product that is unsurpassed anywhere else, at any price. This is not only an investment quality door, it is an appreciable asset that will add to your financial net worth. In the eyes of your family, it will become a cherished heirloom and a priceless piece of immortality that will be tangible for generations. It will serve as a way to celebrate your life, and its direct effects on who they are and what your influence was on your family's history. True artifacts enhance and enrich all of our lives in a way that mass-produced merchandise never will, thus preserving the best of mankind and expressing our love for each other. This intricately designed Art Nouveau door is the work of our world class design department, and in house senior engineers. All of our products are designed, and built under the direction of award winning artist H.J. Nick. Every product is signed and certified as world class fine art quality by H.J. Nick, before it leaves our world class factory. This type of certification ensures that your product has appreciable value in antiquity as fine art. We never use particle board, laminates, veneers, or any other type of faux wood because fine art is never made with cheap materials. Don't settle for cheaply made, mass production doors sold at big box retailers that will need to be replaced every few years. This door features an intricately detailed carved wood design in favor of the ironwork on Lavirotte's original design. These are high relief carvings by the hands of one of our master carvers. Carvings by one master's hands are especially relevant when qualifying a piece as fine art. It is our belief that our combination of top quality materials and master hand craftsmanship allow us to offer a quality of product that is unmatched anywhere, at any price. In fact, we are so confident in the quality of our products and craftsmanship that we guarantee everything forever. Most importantly, every product that we sell is manufactured in the USA, at our Scottsdale, Arizona factory. When we say made in the USA, we mean it, just as we have since 1913. When nothing but the best will do, call us at 1-800-292-0008 to speak with one of our talented design engineers. Get pricing for our Art Nouveau door, or any of our other fine art quality custom doors today. Cet immeuble de style art nouveau, situé 3 square Rapp, a été conçu par l'architecte Jules Lavirotte. L'extérieur est classé à l'inventaire des monuments historiques depuis 1975, l'intérieur l'est depuis 2005. Jules Lavirotte studied at the Ecole nationale superieure des Beaux-Arts in Paris, the most prestigious art school in France. His building at 3 Square Rapp is an unusual mixture of architectural pieces including a turret and individually styled balconies where no two are the same. His whimsical approach to the wrought ironwork on all of his buildings is well known and he included that ironwork in his doors. The flamboyance of the Art Nouveau style combined with his daring and intricate designs makes all of his work unique and recognizable.This Art Nouveau wine cellar door is artist H.J. Nick's modern interpretation of of one of Jules Lavirotte's most famous doors. Inspired by the door found at 3 Square Rapp in Paris, France, this modern, art nouveau style door is sure to turn some heads. Lavirotte, who is famous for his flamboyant, Art Nouveau style of architecture, built the original door and building in 1899. We took that ironwork and art nouveau style of his door and adapted it to a more modern doorway shape and size while keeping the inspiration in the forefront. Our master blacksmiths created the delicate curly cues without making them overbearing, letting the flow of the door lead your eye. The hand forged door pulls fit seamlessly into the swirls of the door and our carvers' work. Celebrate your whimsical side and being a little bit of Paris home with you with this door as the grand entrance to your home.